There can be little doubt that the pharaohs of the New Kingdom, spanning half a millennium of Egyptian history, were indeed god-like beings on earth. 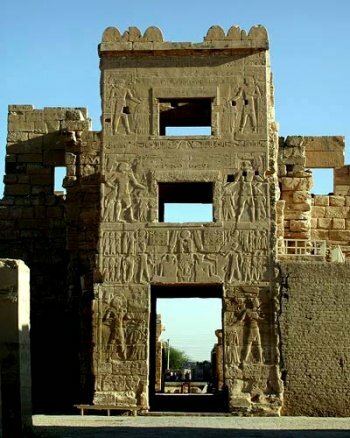 Their immense works, temples and fortresses have left their stamp upon the face of Egypt. We can gaze upon many of their actual faces for, by a strange quirk of fate, the despoiled mummies of the major pharaohs of the period were preserved hidden in two great caches of bodies found in the last century at Deir el-Bahari and in the tomb of Amenhotep II in the Valley of the Kings. Here lay Tuthmosis III, the 'Napoleon' of ancient Egypt; Ramses II, great soldier, builder and the original of Shelley's 'Ozymandias, King of Kings'; and Ramses III, who repulsed the Sea Peoples and left graphic representations of his land and sea battles at Medinet Habu. There are other, perhaps to some people more emotive, names: Akhenaten - was he a heretic, the first monotheist in history, or simply a religious maniac? And, most famously, the pitiful remains of the boy pharaoh Tutankhamun, found in his virtually intact tomb in the Valley of the Kings in 1922, surrounded by gold, his slim teenage body encased in a solid gold coffin.